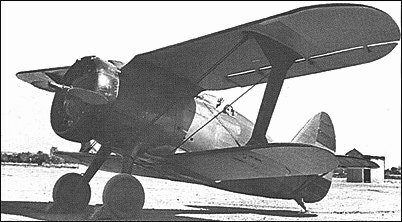 Rehabilitated in the eyes of the Soviet hierarchy by the success of the I-5, Polikarpov initiated design of a potential successor, which, as the TsKB-3 (this designation indicating Tsentralnoye konstruktorskoye byuro, or Central Design Bureau), flew in October 1933. Powered by a Wright SGR-1820-F-3 Cyclone nine-cylinder radial rated at 715hp at 2130m, it was of mixed construction and embodied such refinements as I-type interplane struts, the upper wing "gulled" into the fuselage and cantilever mainwheel legs. Exceptional handling and manoeuvrability re-suited in immediate series production as the I-15 with deliveries of the initial model commencing late in 1934. This was powered by a 480hp M-22 engine and carried an armament of two 7.62mm guns. A total of 404 M-22-engined I-15s was delivered before, in 1936, the imported Cyclone engine became available, this being installed in 59 aircraft before the licence-built version of the Cyclone, the M-25 rated at 700hp at 2300m, was delivered for installation in the final 270 I-15s, production being completed in 1937. In the meantime, armament had been doubled to four 7.62mm guns and an armoured (9mm) seat fitted. Popularly known as the Chaika (Gull), an epithet resulting from its "gulled" upper wing, the I-15 fought in Spain to where 155 were delivered, and was licence-built by the Spanish CASA concern which completed 237 M-25-engined examples, a few of these having the M-25V engine affording 775 hp for take-off. Some 40 late-production I-15s were fitted with twin 12.7mm guns rather than the quartet of 7.62mm weapons. While stationed in China with the B-29 project, the Chinese nearby area had the I-15. The one I saw had a single short round wide wing. Very small cockpit. It was left over from the Russia Air Force that flew in China against the Japanese.